All foreign travelers I know anticipate returning from a trip abroad with a new set of passport stamps. They are a point of pride for many, providing clear documentation of their “worldliness”. I’ve even seen passport stamp collection become a main criteria in determining a trip itinerary. This is especially true in Europe, where the Schengen Agreement eliminates passport control through many countries in Continental Europe. As long as travel is contained within the “Schengen Area”, no passport stamps are given. 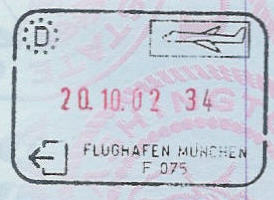 Stamps are only given at the entry and exit points to the Schengen Area. My wife was very disappointed on her first trip abroad to get an entry and exit stamp in Frankfurt, despite the fact that our trip was in Italy and France. Frankfurt was just our connection to the United States. In fact, our upcoming trip to Spain and Portugal will be her first without a connection through Germany. She will get her first non-German passport stamps! Another detractor, however, is that all the Schengen passport stamps are virtually the same. They only differ in the letter in the upper-right hand corner (i.e. “D” for Deutschland or Germany, “E” for Espana, etc.) and the point of entry or exit listed on the bottom. 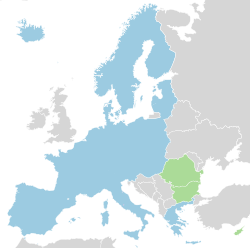 The Schengen Area includes 26 countries in the European Union (see map–blue area are current countries, green is future countries). Travel between them is very similar to travel between 2 states in the USA, with signs marking borders on roads and air travel through “Schengen” gates, similar to the domestic gates at American airports. Notable exceptions are the UK, Ireland, Croatia, and Turkey. Travel through the Chunnel, for example, requires passport control. A day trip to London on the Eurostar from Paris will yield you an exit stamp from France and an entry stamp from the UK. It is important to also plan for the “Schengen Agreement” by allocating connection time if you are flying through a Schengen airport before reaching a Schengen destination. You will have to go through passport control. Similarly, you will need to go through passport control at your last exit point from the Schengen Area. Customs control is less predictable. If your end destination has Customs control, you can likely check your bags all the way through and go through Customs in your final destination. Smaller destinations could require early customs control (for example, we went through Customs in Athens when we flew to Mykonos on a San Francisco – Frankfurt – Athens – Mykonos route). If collecting passport stamps is important to you, then prioritize flights that connect the USA directly to your “stamp of interest”. Many east coast airports, such as Newark, JFK, and Dulles offer direct flights to many destinations in Europe. Another alternative is to connect through Heathrow, which is outside the Schengen Area. If you want to collect multiple stamps during your trip, travel out and in of the Schengen Area would be required (such as going to London between Paris and Amsterdam, or visiting Morocco from Spain). For many, this might seem silly. But for the avid passport stamp collector, itinerary planning is key. This entry was posted in Travel and tagged customs, Europe, passport, travel planning by Ryan. Bookmark the permalink.